we must labor so as to be worthy of it. « Cultivating the land was man’s first task; and it was to become his profession. Emerging from the dark ages and catastrophe, Noah, even more so than Adam, was a great farmer, the father of bread and wine. For behold, the vineyard was given to him, as a sign and a promise: the rugged vines stubbornly persisted, among the hot pebbles of the terraces, twisting and stretching, pushing their roots deep into the soil, sending out branches as if raising their palms, to receive what they needed of the humors circulating in the soil, and the rays of light arriving through the air: everything striving to receive; but also to give. And the clusters of grapes were a wonderful fruit, more full of juice and sunshine than any other, and awaited nothing more than to collaborate with the harvesters and to become wine, to become joy. ». The Benedictine order is well-known for its emphasis on hard work, and capacity to carry out tasks that require great patience, tireless energy and extreme dedication. In other words, it is well-suited to the arduous task of winegrowing. In this spirit, the brothers of Sainte Madeleine and the sisters responsible for the enclosed land at Annunciation strive to uphold the highest possible standards. After the meeting in 2010 with Jean-Dominique Artaud, the Vineyard Manager for 15 years at Domaine de la Janasse (Chateauneuf du Pape), we decided to bring our growing methods up to the level of the top vineyards by following, with some flexibility, the main principles of organic agriculture: “Bordeaux mixture”, sulfur, orange essence, and aromatic plants are given preference in the prevention of vineyard diseases; a plow equipped with a furrow forming attachment and blades that go under the vines to completely remove any vegetation around the base, thereby fully respecting the soil’s composition. A caterpillar-tread tractor to avoid compacting the soil when it has been moistened by rain. On their terraces, the Lux Montis winegrowers, like the monks and the nuns, work meticulously, almost everything is done by hand: planting, pruning, removal of non-fruiting buds and suckers (to avoid having too many grapes and excess vegetation conducive to the development of fungal diseases), topping (for the right balance between fruit and leaves), leaf removal (to ventilate the bunches, and prevent the development of grey rot). There is an artistic dimension to the production of great wines. Miguel Varo, an agronomist specialized in vines helps us during the growing period to optimize the choice of techniques applied in the vineyard depending on the weather during the vintage. The goal is simple: to ensure that the vines to not suffer from high temperatures in the summer, while at the same time maintaining light “water stress” so that the grapes do not contain too much water when they come to be picked. 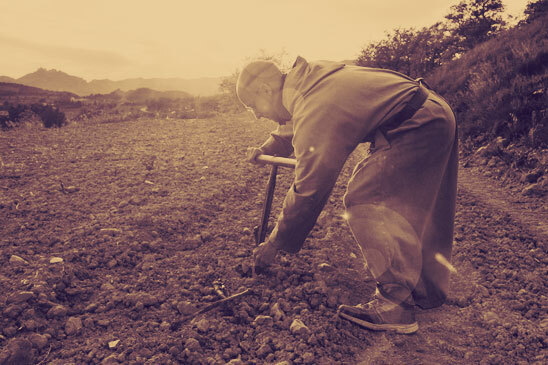 In this way, for some vintages, grass will be allowed to grow between the rows, or between every other a row; in other drier years, the entire vineyard may need to be plowed to avoid the vines going into “shock” due to lack of water. Since every vintage is different, the vineyard has to be managed in a spirit of flexibility and readiness to adapt. As the harvest approaches, the brothers, sisters and winegrowers increase the frequency with which samples are taken to be analyzed for ripeness, and tasted in order to determine the character of each plot for the current vintage. The challenge is to wait long enough for the grapes to be at their best, a complex art when the weather conditions are delicate and grey rot is beginning to cause serious damage. In such situations, one cannot hesitate to undertake a further round of leaf removal, and to remove any bunches affected by fungus. The harvest date is decided by the brother in charge of the Domaine, the sisters, the Lux Montis winegrowers, the agronomist and the three oenologists who oversee our wines. Various factors have to be carefully weighed: quality objectives, the degree of ripeness, the rate of development of possible outbreaks of rot, the time required to manually harvest the grapes, the availability of the brothers, the sisters and the winegrowers… In the end it is a matter of striking just the right balance between risk and caution!… And of the confident prayers of the monks and nuns who entrust all their work and that of the winegrowers to the benevolent protection of the Lord on High, Creator of the Earth. 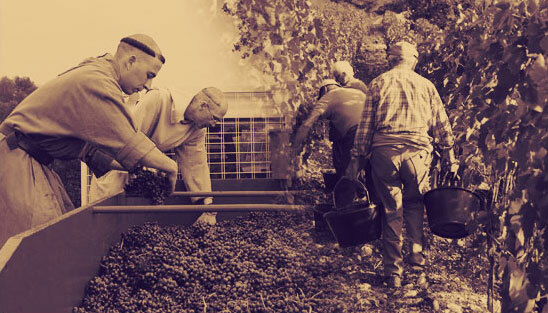 The day of the harvests, the grapes are sorted, bunch by bunch, with the greatest possible care, so that only the highest quality is used to make the wine: a wonderful task that is carried out by each community in a joyous, fraternal atmosphere. At the Abbey of the Annunciation, a small team of brothers transports the crates harvested by the sisters, relieving them of this heavy task. At the same time, at Sainte Madeleine, the community of monks harvests the Abbey’s plots. The brother in charge of the Domaine goes from one sector to another, checking that the grapes are being sorted rigorously enough, and that projected yields are not too from those actually being harvested… And sometimes helping to haul back a tractor that has slid down an embankment. The joys of mountain farming! 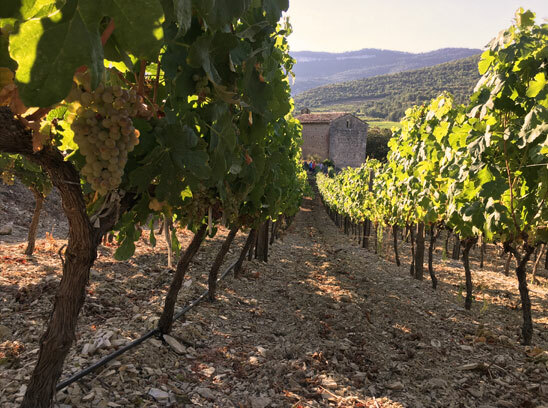 On the winegrowers’ terraces, the teams of pickers apply themselves with equal care; throughout the harvests, monks and winegrowers meet regularly in the winery for the pressing of the white and rosé grapes, and the transfer of the red grapes to vats or barrels. During the days following the arrival of the grapes in the winery, we taste the musts together, a little nervously, as they begin to ferment and reveal something of the quality of the vintage. Then, all through the vinification and ageing stages, the monks and winegrowers meet with the oenologists to determine the various procedures that will be implemented to produce the wines: the percentage of ageing in wood and on fine lees; the choice of wood for the barrels, the blends of different grape varieties and terroirs… Our Cellar Master, Daniel Haïlé, receives the usual technical support from Roland Flores of the ICV. Philippe Cambie (crowned oenologist of the year in 2010 by Parker) gives us highly specialized advice in the vineyard and in the winery at the most crucial stages. 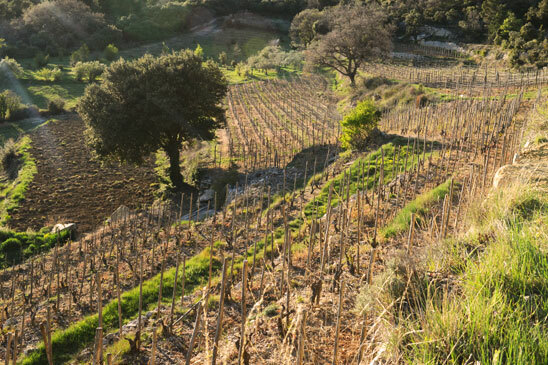 In 2003, we decided to start restoring the old bancaous (“terraces” in the Provence dialect) that sometimes date from the Middle Ages, and to cultivate them according specifications unheard of in Provence: high-density planting (an average of 7,500 vines per hectare), tall trellises on wooden stakes, a meticulous task carried out almost entirely by hand: pruning, removal of non-fruiting buds, elimination of suckers; early removal of some of the grapes (to avoid having too many), topping (to obtain a balance between grapes and leaves), thinning of the leaves (to increase ventilation of the grapes and prevent rot): every effort is made in order to obtain what could otherwise only be dreamed of: the most highly concentrated grapes, enabling the best possible expression of our terroir. We have a deep desire to restore these magnificent sites, often abandoned for several decades for economic reasons, to their former beauty. The rural exodus that resulted from industrialization in the 19th century, followed by the loss of a significant proportion of the agricultural population in the First World War, and finally the appearance of tractors, which led to the concentration of agricultural production in zones that could easily be farmed mechanically, all gradually led to these steep terraces being abandoned. In today’s literature, the planting of crops on terraces is often described as archaic, or as having no economic sense. Going against the trend, it seemed worthwhile to us to plant vines on these neglected plots, that were formerly used for food crops (wheat, rye, fodder for livestock etc.). Vines used to be grown on the edges, to provide enough grapes for daily table wine. 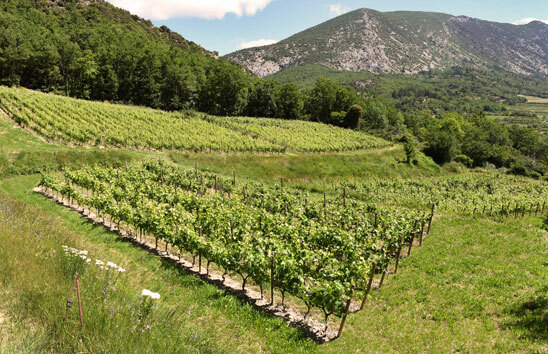 The value of the initiative primarily concerns quality: these hillside terroirs, made up of clay-limestone scree or Trias are very well suited to the production of high quality wines. Crucial factors are the deep but not very fertile soil and the optimal sunshine due to the steep slopes. It is also an invitation to experience an agricultural world that has all but disappeared: the use of terraces to grow crops on sloping terrain used be commonplace, especially in the Mediterranean basin. – it protects soil from possible damage due to storms, erosion, etc. Terrace crops relied on a certain demographic profile, consisting of a pressing need for food combined with an abundance of available of labor. Farming communities displayed remarkable ingenuity in order to be able to farm steep slopes, but the price was considerable work, first in the construction of the terraces and then in their maintenance. We have a duty, as the guardians of a heritage, to preserve our ancestor’s expertise by perpetuating these methods and inviting you to discover them. In order to achieve the qualitative objective for these bancaous, we drew up a specific set of requirements at the winery for the way the vines would be grown. These requirements, to which the winegrowers voluntarily subscribe, are probably among the most draconian in all of Provence’s vineyards. To ensure that they are enforced, a technical committee has been set up to check their application several times over the course of the season. This committee consists of six people: a representative of the INAO, a representative of the ICV, a vineyard specialist from our chamber of agriculture, an independent consultant agronomist, the head of the winery’s “quality committee”, and our Cellar Master. The committee’s role is mainly to help the winegrowers make decisions, from the planting stage right through to the harvest, that will enable them to obtain optimal quality. The committee will then be the sole judge of the quality of the final results: full compliance with the specifications and impeccable quality of the grapes on the day of the harvest are prerequisites for harvests to be incorporated into our finest batches, i.e. those that will be used to make the Caritas wines. We will give details here of some of these specifications, to give an idea of the level of the standard required and to reveal to enthusiasts some of the secrets of the art of winegrowing. Existing bancaous should have an average width of 20 m, and a maximum of 30 m in some places, in accordance with the natural positioning of the terrace in its environment. Newly created bancaous should have a maximum width of 13 m and include an embankment of at least one meter between two consecutive bancaous. At the winegrower’s voluntary request, and in their presence, the committee will rule on the approval of the site. The committee will assist winegrower in the selection of plant material (rootstock, grape variety, etc.). 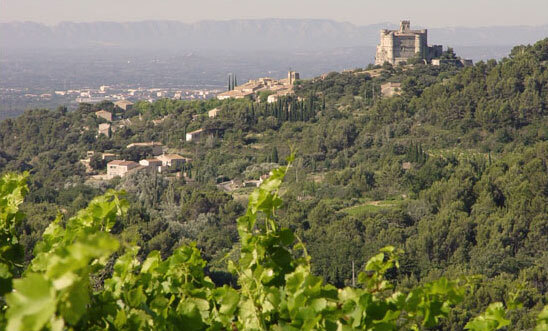 It will provide advice on the creation of the terraces (vines and surrounding terrain). 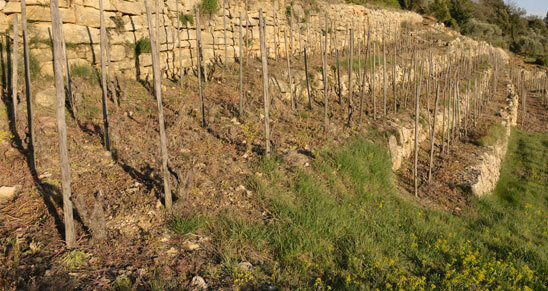 It will check the compliance of the terraces, the trellising, the management of the vines, and their state of health. The full committee must approve each project after a site visit. The theoretical planting density is 6,950 to 8,340 vines/hectare, with a distance of 1.50 to 1.60 m between rows and 0.80 to 0.90 m between vines in the same row. 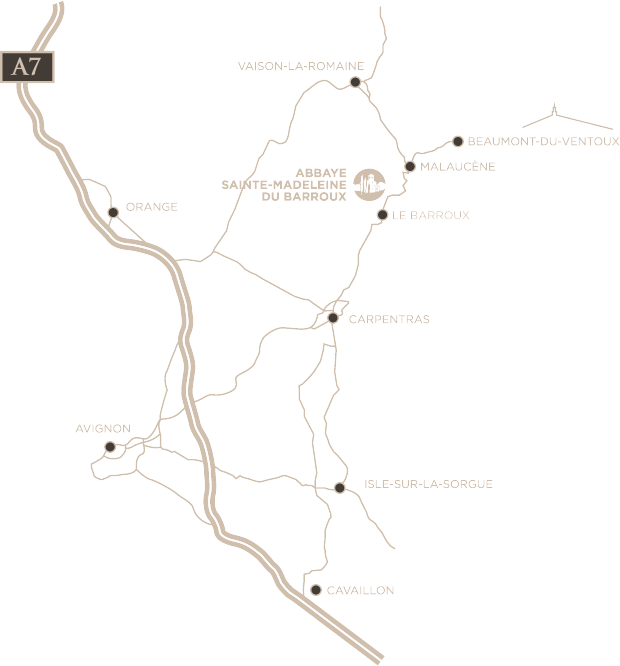 (The usual density in the Ventoux AOP is around 4,500 vines/ha with gaps between rows of around 2.30 m and about 1 m between vines). Double cordon for all varietals and possibly open gobelet for Grenache. Maximum four carriers or spurs per vine to encourage optimal ripening of the berries (compared to six in the traditional Ventoux AOP style). Height of the trunk should be 50 cm, again to encourage ripening (a maximum of 60 cm is tolerated, provided the height of one meter of foliage is respected). Trellising: Wooden posts with wires, or stakes. Minimum 1.40 m above ground with one fixed supporting wire and two levels of lifting wires for wire trellises and three levels for stakes. This consists of the removal by hand all the accessory buds, only keeping the best placed ones. This reduces the amount of vegetation that subsequently requires pruning. It also corrects potential excess yields and reduces the risk of flower abortion (coulure) in sensitive varietals. The best time to carry out this operation is between the end of the stage when the leaves have unfolded and the bunches are visible; if carried out too early (when the leaves begin to appear), then the removal of the buds is neither easy nor complete. If carried out too late (after the bunches have separated), then secondary eyes often remain at the base, obliging a second round of pruning and more rigorous intervention the following year. Topping consists of removing the final bud on the branches or just the tip of the branch including the final bud and the first internodes. Topping (écimage) best describes the first removal of the extremities of the shoots, the term “trimming” (rognage) is used for subsequent interventions or more generally for all interventions of this kind. Physiological effects: encourages fertilization of the flowers and growth of the berries. Reduces the effects of very dry weather. Effects on the microclimate of the bunches: more exposure to the sun and ventilation of the bunches. Effects on the health of the vines. Removal of young growth receptive to fungal diseases. Effects on the quality of the harvest, but care is necessary, as overly severe trimming can delay ripening and result in a reduction in the quality of the grapes. For vines presenting a risk of coulure (Grenache, Carignan etc. ), trim at the end of flowering. 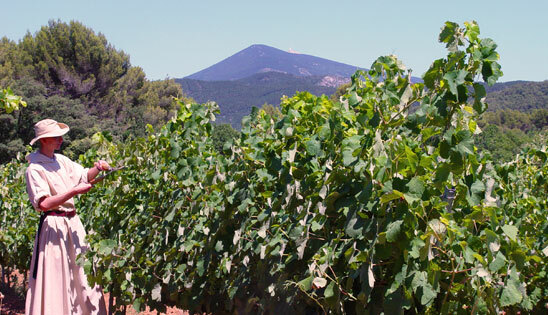 For moderately vigorous vines, the first topping should be carried out as close as possible to véraison (the onset of ripening, when the grapes begin to change color). For more vigorous vines, trimming should be carried out earlier (after the fruit has set) and several times. This should not be carried out too high if there is not sufficiently high foliage. Leaves should only be removed where there are grapes. The highest bunches do not generally ripen as well as those closest to the cordon. Preference should therefore be given to removing the former first. – To adjust the load to the height of the foliage, so as to encourage the ripening of the grapes and obtained the desired degree of concentration. – To adjust the load for each vine and not the entire plot. Two vines bearing 1 kg of grapes each will give better quality grapes than one vine bearing 2 kg to compensate for a neighboring vine that has no grapes. 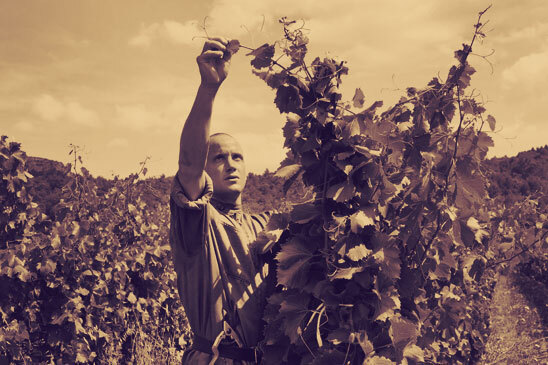 Thinning instructions should therefore be respected for each vine. – To eliminate overcrowding of bunches and the most compact bunches in order to reduce the risk of Botrytis. – To remove damaged bunches or any suffering from diseases (such as powdery mildew) or any that are very late ripening. Thinning should be carried out between bunch closure and the beginning or even the middle of the véraison (onset of ripening). The earlier the thinning, the more compensation phenomena there will be. For weak plots or those at risk of water stress, thinning should be carried out early (or even before bunch closure if symptoms are beginning to appear). Conversely, for more vigorous plots, thinning should be carried out later. Inspection of the raw material at the reception dock: confirmation of the grape variety, the grapes’ perfect state of health and the absence of foreign bodies. Once in production, monitoring and approval of the “terraces” set of specifications by a technical committee, with a minimum of three mandatory visits for the approval of the plot; one during bud removal, a second during leaf removal and thinning, and the third before the harvest. A final visit may be made during the harvest. the maintenance of the embankments, the maintenance of the soil (appropriate plowing and grassing), completion of any transplanting of young vines (with a maximum of 10% missing), trellising, bud removal (which must be carried out leaving two shoots per spur), perfect health. Soil maintenance: the soil must be loose and grassing appropriately managed. Correct bud removal on sensitive varietals. Correct trellising. Topping carried out 30 cm above the top wire and 40 cm in subsequent visits. Trailing vegetation or late topping may result in exclusion from the terraces project. Management of water stress. The committee will give guidelines for green harvesting. Perfect health. Soil maintenance: plowed soil must be loose, and for grassed plots, plant cover must be controlled. Correct trellising. Inspection of green harvesting. Perfect health. Water stress could be a reason for exclusion. Lack of vigor. Hardening off of shoots. Thinning of bunches. Any action to enhance the character of the site (restoration of dry stone walls, maintenance of storage sheds, planting trees etc.) and to develop the vineyard will be welcome. Born in Cordoba in Spain, the grandson of grape and olive growers, I was always fascinated by the world of agriculture. This passion led me to study as an agricultural engineer in Madrid, where I finished in 1998 having specialized in plant science. The situation in the agricultural sector, with some areas in difficulty, or even in crisis, gave me pause for thought. This is why, after working as a quality manager and a technician for a vine nursery in 2003, and then for a wine cooperative in 2004, I decided to create my own company, Varoconsultants, in 2005, with the help of my wife, Carine. • To study the soil’s geological characteristics in order to choose the right rootstock and grape variety. • To stand back and see the whole process: before and after planting, during the growth cycle and then the harvests. • To develop the concepts of traceability, monitoring and quality. It was possible to achieve these objectives right from the start at the Cave de Beaumont, where I was able to carry out my work efficiently thanks to a close collaboration with the president Luc Piquet, his dedicated assistant Agnes, our impassioned oenologist Daniel, the Lux Montis Winegrowers and, of course, the monks and nuns of the Barroux abbeys. All of us strive to produce high quality wines and to ensure that this vineyard, with its exceptional setting, unique history, and remarkably diverse soil and microclimates, continues to flourish! CARITAS is the culmination of this generous collaboration and this diversity. It is a tremendous joy to be able to combine the precision of work well-done with a deep spirit of communion between the monks, the winegrowers and the specialist advisors. 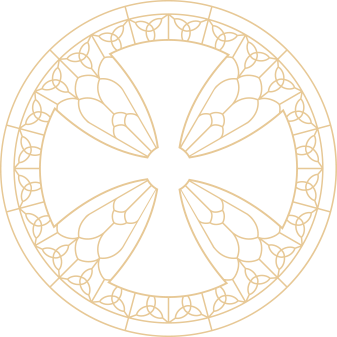 The Caritas vineyard symbolizes this family spirit and is a powerful catalyst. Thank you to everyone! Originally from Eritrea, I grew up in Sweden. My passion for wine led me to leave my northern climes to study oenology in Bordeaux in 2000. Having obtained my degree in oenology, I was lucky enough to work for a few years for a Bordeaux wine merchant based in Saint Emilion. With a view to broadening my horizons, I participated in several vinifications, notably in California and in New Zealand, before returning to France where I vinified the grapes at Château la Nerthe in 2007. I joined the Cave de Beaumont in 2008, and today my passion as an oenologist is fulfilled. Devoted to my work, I consider it my mission to ensure that the wines produced are of the highest possible quality. Naturally, my task is closely related to the meticulous work in the vineyard carried by our winegrowers. Essentially, the challenge is to respect this noble raw material: these grapes, so well cared for, and harvested at optimal ripeness, while at the same time reducing any unnecessary operations, so as ensure the quality of the fruit that is acquired over the course of the year. The objective of this philosophy is ultimately to produce excellent wines, which also express the authenticity of the winegrowers’ work. With the Caritas wines, the emphasis on the interaction between the terroir and the vines is even more intense. The monks’, nuns’ and winegrowers’ tasks in the vineyard take on a creative, artistic nature and I carry out my work in the winery in the same spirit. The success of these joint labors is reflected in the vibrant expression of our wines. It is a real joy to work together in this way, producing these wines through all the seasons of the year, thereby participating in the distribution of Charity: a treasure that wine symbolizes so well.